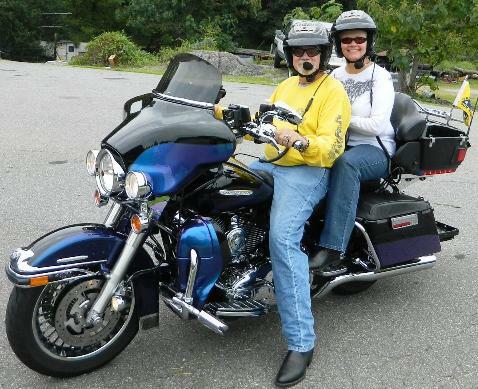 We have been married for 40 years and riding together since 2000. We ride locally and travel as much as we can. We try to get a trip in with friends to the mountains of North Carolina each year. We enjoy the roads and scenery in western N.C. In the summer of 2011 we rode to Milwaukee, WI and visited the Harley Museum. That trip included 3 separate Long Distance Riders “Easy Rider” days. Our H-D Ultra is our 4th Harley and between them I have logged well over 100,000 miles. In 2010 we rode to Natchez, MS then north on the Natchez Trace to Nashville, TN. We visited a few Nashville Honkytonks and enjoyed some great country music. In 2008 we rode to Myrtle Beach S.C. and up the Outer Banks of North Carolina to Nags Head & Kitty Hawk, a spectacular trip that included 4 different ferry crossings and lots of truly awesome scenery. We plan to ride to Milwaukee, WI again in 2013 for the Harley Davidson 110th Anniversary celebration. We are also members of the Tallahassee Chapter of the Harley Owners Group and enjoy the club rides and activities. In the past, Dave has served as Chapter Director, Asst. Director, Activities Director, Head Road Captain. Dave is a member of the riding group known as the North Florida Peckerheads, a guy’s only group that rides to Franklin, NC each year for 4 days of intense mountain road riding. The NFPH holds court every Thursday night at the K & K Fish Camp on Lake Iamonia north of Tallahassee.